This year's Feast of Tabernacles is very significant. You need to be reminded again why God ordained this Festival — just where we are now in the unfolding panorama of world events — the true significance of this year's Festival. Let's be sure we understand what our lives are all about! Here we are in the middle of the ninth decade of the 20th century. We know we are in the very last decades of the 6,000 years of human life on this earth. And at the end of that 6,000 years Jesus Christ will come IN HIS GLORY AND SUPREME POWER! He is coming to remove Satan from deceiving mankind. He is coming to GOVERN — to RULE OVER ALL NATIONS! And we of the Church — IF we remove all our spots and wrinkles (Ephesians 5:25-27) — are to have important positions in the worldwide GOVERNMENT TO RULE ALL NATIONS FOR A THOUSAND YEARS! 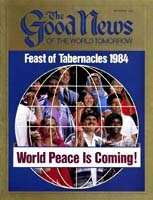 We keep the Feast of Tabernacles to get a foretaste of that wonderful WORLD TOMORROW. And it is nearer now than you think! We need to get our bearings. We need to know what went on before — and where we are today in the events working out God's tremendous MASTER PLAN! First, angels inhabited this earth before man. Those angels SINNED (II Peter 2:4) under the super archangel LUCIFER (Isaiah 14:12-15), who was created by God PERFECT IN ALL HIS WAYS — until rebellion and iniquity were found in him (Ezekiel 28:15). Lucifer's name was changed to SATAN. Then God created MAN — male and female — Adam and Eve. God instructed them fully, but they rejected God as revealer of knowledge, as their God and as RULER. So God SHUT ALL MANKIND OFF FROM HIM AND HIS HOLY SPIRIT (Genesis 3:22-24) except those infinitesimal FEW God would specially call for SPECIAL COMMISSION OR DUTY PREPARING FOR HIS KINGDOM. For almost 6,000 years now, NO OTHERS BUT THOSE FEW have been able to come to Jesus Christ (John 6:44), although millions have been misled by Satan to think they are Christians. God has called NO ONE JUST FOR SALVATION! You were called for the special duty of standing behind Jesus Christ's apostle in preparing for THE KINGDOM OF GOD! We, then, are a SPECIAL and PECULIAR PEOPLE (I Peter 2:9), not OF this world — thousands of people backing Jesus' apostle in going to the world. God established a 7,000-year MASTER PLAN for accomplishing HIS PURPOSE in MAN! Yet there is DUALITY in everything God does. God's work through humans started with the creation of the first man, ADAM (and his wife, Eve). The PHYSICAL creation of man began with Adam. But the SPIRITUAL creation of man begins with the second Adam, JESUS CHRIST. Man's ultimate spiritual creation BEGAN with Jesus Christ. To keep His Church in mind of God's SPIRITUAL CREATION OF MAN, God appointed SEVEN ANNUAL FESTIVALS! The FIRST of these festivals is the PASSOVER, which comes on the eve of the 14th day of the first month of the sacred calendar, in the spring. The SECOND festival, the Days of Unleavened Bread, lasts SEVEN DAYS, the first and seventh of which are annual SABBATHS. The Passover pictures to us the DEATH OF JESUS CHRIST — His SHED BLOOD for the remission of our sins UPON REAL REPENTANCE. The second festival pictures the coming out of SIN, as the Israelites came out of Egypt during those same seven days. The THIRD festival is the "Feast of Firstfruits," called in New Testament times "Pentecost." It reminds us that the FEW of us in God's Church are only the FIRST SMALL HARVEST of God's spiritual harvest. The FOURTH festival, the Feast of Trumpets, comes on the first day of the seventh month of the sacred calendar. It pictures to us the RETURN OF JESUS CHRIST TO EARTH IN SUPREME POWER to rule all nations. Up to then, the VERY FEW called by God have had to overcome SATAN and SATAN'S WORLD. To attain salvation is MUCH HARDER than it will be for the overwhelming MAJORITY to be called during the Millennium and Great White Throne Judgment. But, if we OVERCOME Satan and his world, we shall REIGN WITH JESUS CHRIST! The FIFTH festival is the most solemn day of the year, the Day of Atonement — a holy convocation. It is a day of fasting. It pictures Jesus Christ doing away with Satan, so that Satan cannot tempt those during the Millennium or the Great White Throne Judgment. It pictures AT-ONE-MENT with God. Then the SIXTH festival is the one we are now about to celebrate — the FEAST OF TABERNACLES. It pictures the GREAT MAIN HARVEST OF THIS 7,000 years. The SEVENTH festival, the Last Great Day, follows the SEVEN DAYS of the Feast of Tabernacles. The first of these seven days is a high Sabbath, and the one day following the Feast of Tabernacles — the eighth day — is a high Sabbath, picturing the GREAT WHITE THRONE JUDGMENT. The Feast of Tabernacles is intended to be a time of inspiration, a time of REjuvenation! It is the only time in the year that God makes it possible for all His children to rest from their regular duties, to worship and rejoice together, to concentrate on the deep meaning of the age in which we live and RENEW our personal dedication to the commission we have been given! Attending this Feast of Tabernacles, YOU should be refreshed by living eight days in a manner that renews your perspective of God's coming Kingdom and REDEDICATED to go out another year progressively fulfilling the work we have been given to do. This year, perhaps more than ever before, we need to attend! The strengthening of our resolve to fulfill the great commission of preaching the Gospel to the world is bringing new vigor and NEW PERSPECTIVE into a more dynamic and dedicated Church. We ALL need to feel this impact. Pray to become more inspired and more dedicated to the work that yet lies ahead. This Feast is the time for us to hear the vital messages that relate to the times in which we live and the deep meaning of the prophetic events that are beginning to happen. Sermons portraying the meaning of recent events and the fulfillment of prophecy in our time will be absolutely vital to hear. You cannot afford to miss a single service! God knows His Church needs new LIFE, new VIGOR and GREATER INSPIRATION! This Feast of Tabernacles promises to be jam-packed with just what you need to fulfill the very purpose for which you are on earth. When this Festival brings some 6,000 to 10,000 people into a community for eight days, the impact on that area is simply UNPRECEDENTED! The entire community wonders what these people will be like. Anticipating the worst (having experienced other large crowds drawn by rock bands and public demonstrations), and yet hoping for the best, each area in its own particular way girds for the onslaught of our "conventioneers." For example: Our Festival Office staff members are often asked: "What kind of people are these?" "What do they believe?" "What is the Feast of Tabernacles?" "How will they treat my establishment?" "Are they heavy drinkers?" These and dozens of other questions are running through the minds of thousands of the local residents. You will give them the answers, by your example, for a full eight days! Here is the opportunity to be a LIGHT to the world by LIVING the picture of the Millennium — the Kingdom of God in action on this earth — as a witness to these people. We can, by our own PERSONAL EXAMPLES during this Festival, be used by God as a powerful witness that may help lead others into the very truth of God and a way of escape from the terrible times ahead! THINK about that as it is a very real responsibility! God expects us to set an example for others. That EXAMPLE is Jesus Christ living His life in you! At the Feast of Tabernacles, we should express to each community the fruits of a totally changed and converted life. That is a very important way in which each one of YOU can serve! Jesus lived a life of cleanliness; He took care of the property of others! He undoubtedly paid His bills in full and on time. Let's be aware that our relationship with each individual with whom we come in contact at the Festival is representative of the Church as a whole. We have been called out of a darkened world to be a light– to shine before men that they may see our GOOD WORKS and glorify our Father who is in heaven. Drinking, for example, is a part of this festive week when done in MODERATION. However, let's not flaunt this privilege before the community by drinking to excess! We need not hide what we do, but we do need to guard against setting a wrong example in the communities that are hosts of the Festival. The apostle Paul said, "Do not let your good be spoken of as evil" (Romans 14:16). Paul continued to say, "It is good neither to eat meat nor drink wine nor do anything by which your brother stumbles or is offended or is made weak" (verse 21). We are to be a light and an example to others. Please set a good example and BE MODERATE in ALL things! Remember, also, God commands US NOT TO COME EMPTY to His Festival, but to plan ahead, and be prepared to give a generous offering, ACCORDING to the blessing He has given us. Notice! "Three times a year all your males shall appear before the Lord your God in the place which He chooses: at the Feast of Unleavened Bread, at the Feast of Weeks [Pentecost], and at the FEAST OF TABERNACLES; and they shall not appear before the Lord empty-handed" (Deuteronomy 16:16). God says each is to give, AS he is able (verse 17). Where OUR TREASURE is, that is where our HEARTS will be also! Where is YOUR heart? Hopefully IN the work Jesus Christ is doing! So please THINK about it. Remember that "God loves a cheerful giver" (II Corinthians 9:7). PLAN to give as generous an offering as you can possibly afford, according to the blessing God has given you. We are God's people! Let's continue proving it to Him! This year we are again looking forward to one of the finest, most inspiring Feasts of Tabernacles of all! There is no way to describe the emotional IMPACT and the DEEP THRILL that can be yours in journeying to the place God has set His name in a humble, yielded and worshipful attitude where thousands of others are assembled together, gathering as one family in one place for the observance of God's annual Festival! From the first sound of thousands of voices lifted in song during the opening service to the closing prayer, the Festival is always an exciting, thrilling and never-to-be-forgotten experience. There will be literally thousands of fellow heirs in Jesus Christ in our midst, thousands to whom every day, every event will be an experience they will cherish for the rest of their lives! Just think of what lies ahead during the week of the Feast of Tabernacles: the wonderful opportunity of visiting and fellowshipping with thousands of others in whom is the Spirit of God; attending inspiring, uplifting, dynamic services and hearing the meaningful sermons; attending the many special activities scheduled; participating in Bible studies, family occasions, recreational activities such as boating, waterskiing, picnicking, hiking, bicycling, horseback riding, fishing, visiting historical sites or tourist attractions or just relaxing with one's family around the pool with a group of friends. God has given you all this — and more — in His Feast of Tabernacles! However, let's keep this Feast fully understanding WHY we do so, RENEWING once again the meaning of this Festival and REDEDICATING ourselves to the work that God has called us to finish. May God be with you and bless this Feast of Tabernacles even beyond our expectations!